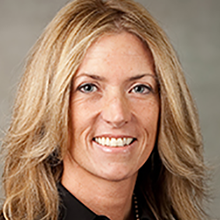 Maeve McKenna Duska is responsible for USA Technologies’ marketing planning, strategy and execution. She re-joined USA Technologies in March 2004 where she was responsible for developing and implementing marketing collateral and campaigns for the company’s flagship ePort-branded cashless payment and telemetry service. During her recent tenure at USA Technologies, her responsibilities expanded to include marketing planning, strategy and execution for all the company’s products and services, as well as market research, sales support, budgets and strategic partnership development. Ms. Duska was named to her current position in 2009. Ms. Duska also served as Marketing Manager in the Higher Education division at Aramark, responsible for developing, supporting and executing the marketing and communications strategy for high-visibility accounts including the University of Pennsylvania, the University of Delaware and St. Joseph’s University. Prior to Aramark, she served as Marketing Communications Manager for USA Technologies through its acquisition of Stitch Networks, a cashless payments and M2M telemetry services provider. She received her Bachelor of Arts from Rosemont College.